If your house is like mine, there is always leftover cranberry relish from the Thanksgiving dinner. 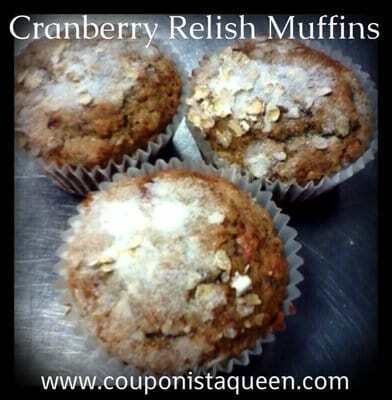 My mother is a professional baker and she came up with this recipe to use the relish (or sauce) to make delicious Cranberry Relish Muffins. You can also use my recipe for Cranberry Orange Relish if you prefer! Enjoy! If you like nuts, add 1/2 cup of chopped walnuts or pecans. Mix the dry ingredients into the wet till well blended. Spray a cupcake pan with non-stick spray or use cupcake papers. Fill the cups 7/8 full. Sprinkle the tops with some oats and then with granulated sugar. Bake at 400° for 18-21 minutes or until the top bounces back when gently pressed. Allow to cool in pan a few minutes before removing. Serve warm for breakfast or cool completely before storing in tupperware.